Village Inn Event Center serves Winston-Salem, NC and the Piedmont Triad area, and surrounding communities. Much more than an Event Center, Village Inn is a dynamic venue that offers a fresh approach to your next meeting, conference, fundraiser or social event. Multiple gathering rooms offer captivating spaces and desired amenities, functionality, and modern style to one of Winston-Salem’s most vibrant areas, Village of Clemmons. Rest comfortably in 141 adjoining guest rooms and suites that provide for a relaxing, hassle free experience. The onsite Crosby Pub and Restaurant is a well-known local gathering spot for golf enthusiasts, sports fans, active civic groups, and families. Come see why we are known as “One Venue, Endless Possibilities”. Online Reservations Meeting Space and Facility Layout Request for Proposal. Village Inn Event Center is impeccably designed with an open layout, easy to access with one level entry to 10 Banquet Rooms, and an inviting traditional vibe which comes together in a truly original venue designed to accommodate weddings, grand receptions, meetings, conferences, cocktail parties and more. All 10 Gathering Rooms are individually named with their own ambience and are easily transformed into a space that’s exclusive to you and your event. Guests enjoy in-house catering by an Executive Chef inspired by local flavors infused with an international flair. A professional event planner is happy to discuss your vision and walk you through the endless possibilities. Centrally located in Beautiful Clemmons, NC, Village Inn Event Center puts you within walking distance to restaurants, shopping, and nightlife with easy access to all major highways. We’re conveniently located less than ten miles from Wake Forest University, the Downtown Arts District, downtown Winston-Salem, Old Salem, Salem College, Winston Salem State University and NC School of the Arts. And guests are right next to the adjoined 141 beautiful guests rooms and suites, a KZ Hotels property. Impressive 8,190 square foot ballroom complete with the area’s largest permanent dance floor. Crystal Chandelier lighting, elegant staircase, and a maple hardwood dance floor adorn the Crystal Ballroom with just the right size to make the best impression for any social event. Additional social areas and open spaces for smaller meetings, breakout sessions, brainstorming, or networking. Keep the conversation going in our relaxing outdoor swimming pool and deck. 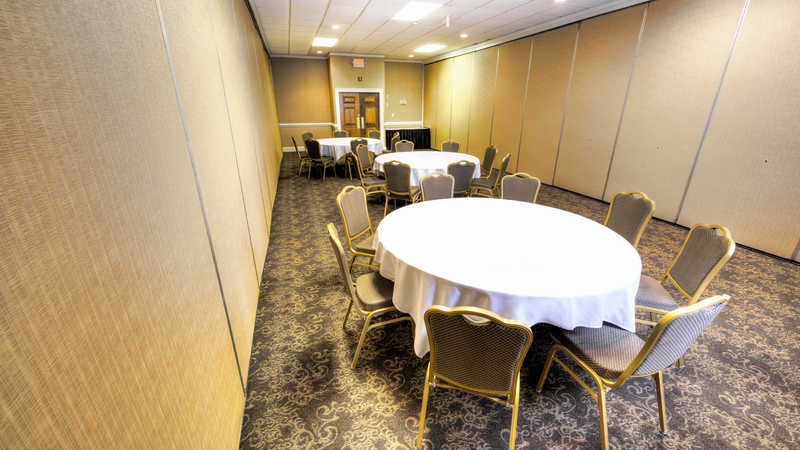 Professional audio/visual equipment, abundant outlets, and Complimentary High Speed Wi-Fi access. Event Planner ensures a seamless and successful experience. All of the food last week was spectacular! Great Job with the Event and shifting rooms continuously. Your servers were wonderful!!!! This is David O’Neal from Leonard. I would like to thank you for the way the event was managed this weekend by your staff. Thanks so much for making it another great event for us! Thanks so much to you and the great staff there for allowing me an amazing birthday celebration. The bartender was Awesome! The food was great, as least I was told (never got any) if I have any other events I will definitely be in touch with you. Have a great week! Thank you and your staff soooo much! Thank you for helping and the response time on all that we needed was incredible! We had a great time!! Thank you for all of your help!! Everything went well yesterday! The room set up was great, food was delicious and the hostesses were friendly and helpful. Thank you for all of your assistance during this process. Thanks so much for taking such good care of our guests. We heard nothing but praises. It was a wonderful wedding weekend! We look forward to seeing you in the future and recently recommended you to a dear friend who is considering having her daughter’s reception in the Crystal Ballroom next year. Thank you, Lana! We truly enjoyed The Village Inn. Everything was great and just as ordered. We had absolutely no problems. I want to thank you so much for all the help you gave in preparing for my daughter Jassmyne Ferrell and Devon Constable’s wedding. You were always there when I had questions or concerns, and trying to arrange this wedding while I was in New York and my daughter was in North Carolina was very difficult. I would not have been able to give my daughter the ‘wedding of her dreams’, as she puts it, without you there every step of the way. For this, I thank you. The venue was absolutely beautiful. The staff you had assisting us were so helpful and accommodating. Everything worked out so perfect from the moment we began to plan this event. There is so much more I want to express and so overwhelmed with how everything came together perfectly for the most important day of my daughter’s life. It brings me joy that you were part of the entire event. I cannot praise you enough. The day was perfect in every way. Thank you so much. Thank you so much for your help in providing this. Thanks also for accommodating our crew this past weekend for the snowy weather. We appreciate it! Hi Lana, this is just a note of appreciation and thanks for the aide and execution of my retirement celebration. I’m so glad I was led to consult with you about it and you and your wonderful staff made it happen for me. I certainly understand the popularity and compliments your establishment has and I pray your continued success. Thank you for everything including the transaction with Ms. Jordan. You’re the best. I just wanted to thank you and your team for having everything set up perfectly for our seminar last night! Just wanted to drop a quick note to let you know that everything was fabulous! The room was very nice and the food was wonderful! Everyone really enjoyed it. Hopefully, we will do this again next year vs. a restaurant. It was much easier. Our staff has had nothing but good things to stay about their stay and the way the rooms were setup for the workshop at the Village Inn. Executive Director Huffman called as well and said you guys did an excellent job setting everything up for the workshop and accommodating our staff. Betty and I wanted to follow up with you as well ! Please let us know if you need anything on our end. Thank you so much for the room set up yesterday. Your staff always shows us so much hospitality when we meet at the Village Inn . Hey Lana,. I just wanted to say Thanks for helping make our night so wonderful. Everyone enjoyed the food and many compliments on the Crystal Ballroom. The ladies that helped with serving and clearing tables were very professional. We do hope to be back for our 50th in 2021. We hope to start planning in the new year. I will be calling you to ask a few questions for information about our plans for 2021. Our committee will be meeting in a few weeks to go over pros and cons from Saturday night and discuss some beginning plans for our next reunion. We appreciate your wonderful attitude and patience with us! Really enjoyed our stay with you this weekend! Everything was great! Thank you so much for hosting your amazing Zumbathon. We are so fortunate to have the opportunity to partner with you and Women’s Wellness. You are doing so much more than raising money for our community; you are bringing the community together to raise awareness and support for those who are fighting breast cancer. I am continuously amazed by the work you do. Just wanted to say thank you for all you did to make our wedding evening a success! You are great for Village Inn. Cheryl – Mother of the Groom!! Hi Lana. Stacey and I wanted to thank you once again for everything you and your team did for us over the past weekend. You guys were truly amazing, and I know every parent on the team felt the same way. Good afternoon and thanks Beth. We had a great week-end. You have an incredible staff that went the extra mile with everything that we asked. The meals were great also and a good price!!! I can’t say enough positive stuff about our Dixie Cup event this weekend!!!!! Everything we heard from our guests was positive, especially the dinners. I can’t count the number of people who gushed at me about what a good time they had and how everything went smoothly. Thank you for a terrific job. Thanks again to you and your wonderful staff (especially Javier) for totally exceeding our expectations. We would definitely recommend the Village Inn for future events in the area. My Exxon Mobil Annuitants Group completed it’s 19th consecutive golf outing at The Village Inn & Tanglewood on April 19th and 20th, 2016, and our experience was so good, I cannot for the life of me convince them to go somewhere else in 2017! That’s as good a compliment they can give for your service and facilities! This is Ginny. Just wanted to thank you so much. Everything went so well Sunday. I mean it was just MARVELOUS! The Lady and the Gentlemen that worked with us were great. I am just high maintenance, and they did everything we asked them to do. Thank you so much! Thanks for everything Lana! Very nice hotel and the NCA members really liked it. The location is so perfect. The staff was nice to us and the whole set up was impressive. Let alone the hospitality complementary room. CROSBY PUB & RESTAURANT Doors Open at 5pm #HalfPriceWingsMonday 1/2 Price Wings!! $2 Draft Beer Full Bar & New Menu! !